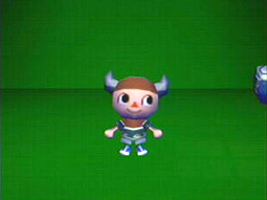 A updated GameCube release of Dōbutsu no Mori, and the first game in the Animal Crossing series to be released outside of Japan. You have moved into a new town with no money to your name. Work off your debt and pay for your house by helping the people around town. Buy, sell and trade items, furnish your home and become part of the growing community in your little village. 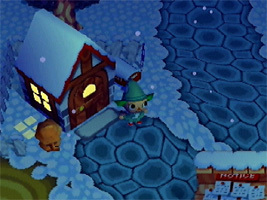 More animal characters and events have been added to this release, and Game Boy Advance connectivity allows you to visit your second home on an island to the south. 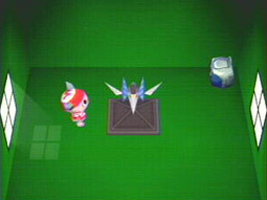 You can then take the island with you on your Game Boy Advance, allowing you to find rare items and furniture. The game was upgraded even further for the western release, with new content and additional support for the Game Boy Advance Card-e Reader. Animal Crossing has hundreds of pieces of furniture to dress your house in. Quite a few pieces of furniture are based on Nintendo and their games. One of the themes you can decorate your house in is the Classic Mario theme. All of the furniture, wallpaper and carpeting are based on the 8-bit sprites from Super Mario Bros. 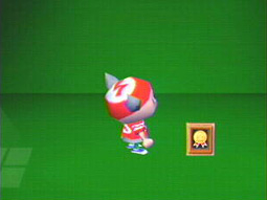 These items could only be obtained using special codes found in Nintendo magazines and websites. 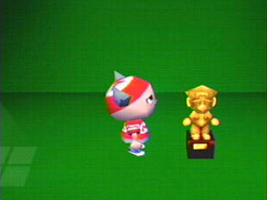 A golden trophy of Mario, acquired in the lottery. Part of the Lucky Nintendo furniture set. 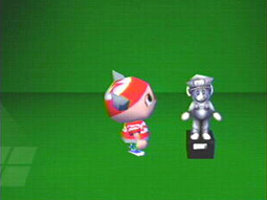 A silver trophy of Luigi, acquired in the lottery. Part of the Lucky Nintendo furniture set. A small medal with the outline of Mario's face on it. Available as a gift if you win the Fall Sports Fair. 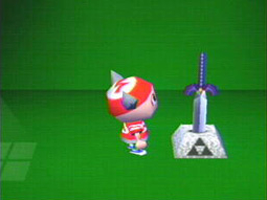 The sword from The Legend of Zelda series, embedded in a stone plinth featuring the Triforce emblem. A model of the ship from the Star Fox series, displayed on a pyramid structure. 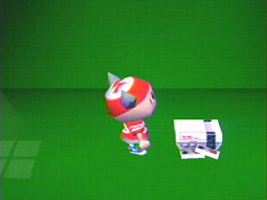 A 3D box modelled after the GameCube logo. 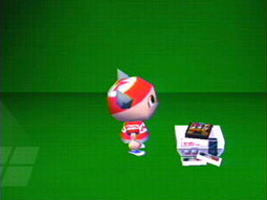 A 3D box modelled after the Nintendo 64 logo. 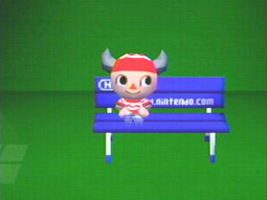 A blue bench with the Nintendo logo and website address on it. An empty Nintendo Entertainment System console. As well as the standalone NES, you can also collect NES consoles with games. Once collected, the full original game can be played on the GameCube, or sent to the Game Boy Advance using the GCN-GBA Link Cable. Some of these games are given as gifts, some can be bought or found, and some can only be gotten by using a Universal Code or e-Reader cards. In the Japanese version you collect Famicoms instead of NES consoles. Clu Clu Land D is the Famicom Disk System version of Clu Clu Land, which featured additional levels and gameplay elements. It was only available outside of Japan as the VS. Clu Clu Land arcade machine. Nintendo also included patterns based on Nintendo characters, mainly intended as clothing, but the patterns could also be used for other things. A red shirt/hat pattern featuring the "M" logo from Mario's hat. A green shirt/hat pattern featuring the "L" logo from Luigi's hat (from the Mario series). A red shirt design with white dots. 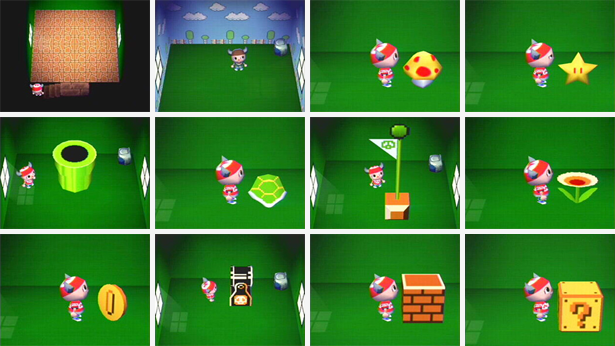 Named after Toad from the Mario series, although Toad's mushroom cap is white with red dots. A green and brown shirt design, based on the shirt worn by Anju, a character from The Legend of Zelda: Majora's Mask. A shirt featuring the GameCube logo. 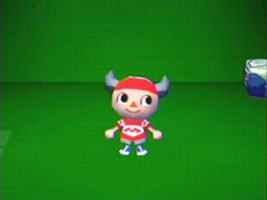 A number of the villagers' names or appearances appear to reference Nintendo. A lazy alligator who wears the Big Bro Shirt, referencing Mario. His default catchphrase is "It's-a me! ", which is based on one of Mario's many catchphrases (notably, the first phrase spoken by Mario on the title screen for Super Mario 64). A jock gorilla who strongly resembles Donkey Kong. He also wears the Li'l Bro Shirt, which references Luigi from the Mario series. A lazy penguin who wears the G Logo shirt. Both the shirt and his name reference the GameCube. A cranky frog. Its English name may be a reference to Wart, the final boss of Super Mario Bros. 2. The mysterious fortune teller named Katrina has the image of the Triforce from The Legend of Zelda series drawn on the inside of her tent. The tent layout is also similar to the fortune telling shops in The Legend of Zelda: A Link to the Past. K.K. Slider (Japanese name Totakeke) is a guitar-playing dog that appears outside the train station every Saturday night at 8. His design is based on Kazumi Totaka. You can either request a song or ask him to play a random song, but there are some secret songs he will only play when requested. Request the secret "K.K. Song" and it's a version of Kazumi Totaka's Song. When he's finished playing, he gives you an aircheck that you can play on the tape deck in your house. This sounds more like the original digital beeps. The song also appears when you scan some Animal Crossing-e e-Reader cards. Cards P15 and P13 have been confirmed to contain the song. It's also worth noting that Kazumi Totaka is credited as the sound designer on the e-Reader itself. One of the items you may be asked to collect from a forgetful villager is the Pokémon Pikachu 2, a pedometer-based virtual pet starring Pikachu. This is the second version, with the translucent grey case and color screen. Another item you may be asked to collect is the Game Boy. Each day, one of the rocks in your town will have bags of Bells inside. Repeatedly hit it with your shovel to make the Bells fall out. The last three bags of Bells make the 1UP sound effect from the Mario series when they come out. "It's a ME! Hey, good impression, right?" This impression is of Mario, and one of his trademark catchphrases. Can games sing like me? Sometimes Kapp'n will also ask you if you've ever spent a night in a Hyrulean prison. Hyrule is the setting of The Legend of Zelda series. When Gracie is wearing an official Gracie design shirt, she will say that it's part of last year's Hyrulean line, referring to Hyrule from The Legend of Zelda series. Sometimes when inspecting a cabinet you will find 100 rupees, but they're useless here. Rupees are the currency in The Legend of Zelda series. "I wonder if it's Hylian?" This is a reference to the Hylian Loach, the rarest and most difficult fish to catch in The Legend of Zelda: Ocarina of Time. Sometimes, one of the villagers will ask you to help them navigate the maze in the back of their Nintendo Power, the official U.S. Nintendo magazine. "I was in the middle of one great catnap when I saw you in the strangest dream. You were running around on a tropical island with a water pump on your back!" This refers to Super Mario Sunshine.